These 1/6-scale pilot figures from BlueBox Toys are perfect for many scale jets and WWII fighters. Problem is, they are collectibles and can be hard to find. 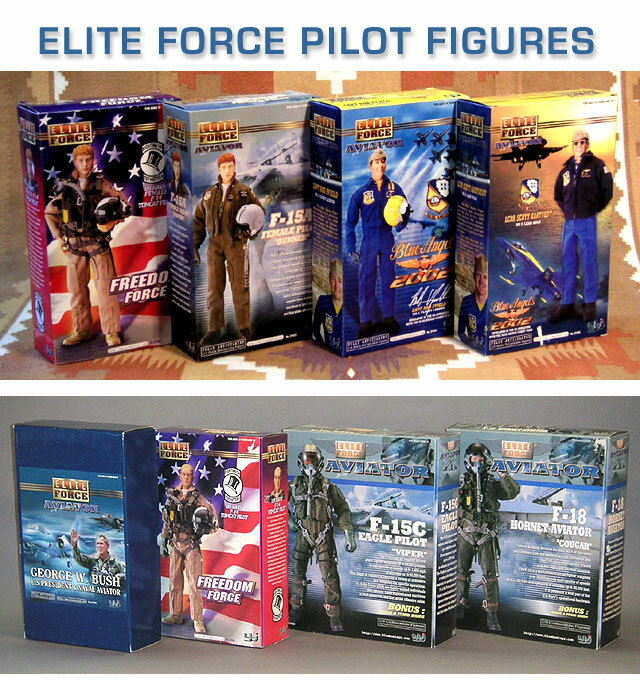 BTE is proud to offer an assortment of their most sought-after pilots, all new in the box. These fully-articulated 12" figures come with authentic uniforms and super-detailed helmets, masks, and various flight gear. Yes, some "surgery" is required to make them fit in your warbird cockpit, but serious modelers would settle for nothing less. Click here for pilot mounting instructions. Rare figurine in deluxe box with lots of accessories. 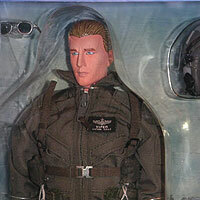 Includes ultra-detailed flight suit, helmet, oxygen mask, life vest, wrist watch, radio, duffel bag, and assorted gloves. plus $10.50 shipping in U.S. In addition to his US Navy flight suit, this pilot comes with a survival vest, emergency floatation device, helmet with visor, and oxygen mask. The amount of detail in the vest alone is incredible - buckles, zippers, and clasps are all functional. This particular figure is rare and hard to find. Female counterpart to the pilot shown above. 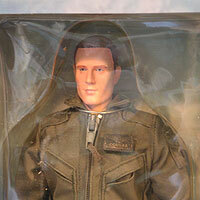 The packaging and accessories all appear identical to the male version. Only difference seems to be the figure itself. With the helmet on, visor down and oxygen mask in place, it would be difficult to distinguish from the male version. Okay, military purists will have a hard time putting an Air Force Pilot in a Navy airplane. 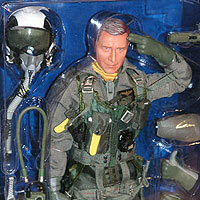 But the Reaction ARF isn't a pure scale model, and let's face it - this pilot would look awesome in just about any jet. Includes harness, helmet, oxygen mask, and lots more. RARE. 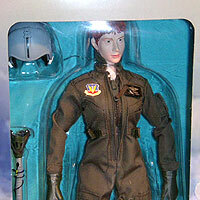 This pilot is a little easier to find than the male F-15 pilot, so it costs a little less. She looks great in the cockpit - her all-gray helmet works well with the orange/white Navy Trainer version of the Reaction ARF or the ReVision. 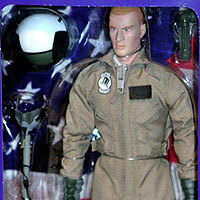 Includes MA-1 flight jacket, helmet, and oxygen mask. Deluxe package with super-detailed accessories. Suitable for many types of jet models. Includes helmet, oxygen mask, safety vest, and lots more. RARE. This is the pilot I chose for my first Reaction ARF, as shown in the online instructions. 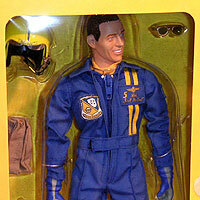 The blue flight suit and yellow helmet made this a natural for the blue/yellow color scheme. 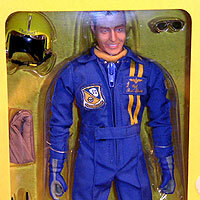 Includes a very cool Blue Angels jacket, sunglasses, and cap. 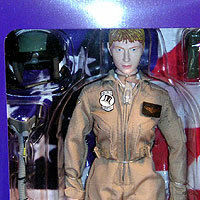 This appears to be the same package as the one shown above, with a different head. The helmets come with a mirrored visor that can be raised and lowered, and a very intricate microphone. 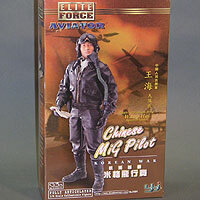 Korean War era pilot would be perfect for a Mig-15 or a custom painted Reaction ARF. Includes jacket, leather helmet with goggles, oxygen mask and more. EXTREMELY RARE!